We show by direct numerical simulation (DNS) that the Lagrangian cross correlation of velocity gradients in homogeneous isotropic turbulence increases at short times, whereas its auto-correlation decreases. 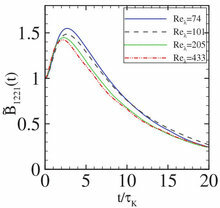 Kinematic considerations allow to show that two invariants of the turbulent velocity field determine the short-time velocity gradient correlations. In order to get a more intuitive understanding of the dynamics for longer times, heuristic models are proposed involving the combined action of local shear and rotation. These models quantitatively reproduce the effects and disentangle the different physical mechanisms leading to the observations in the DNS.